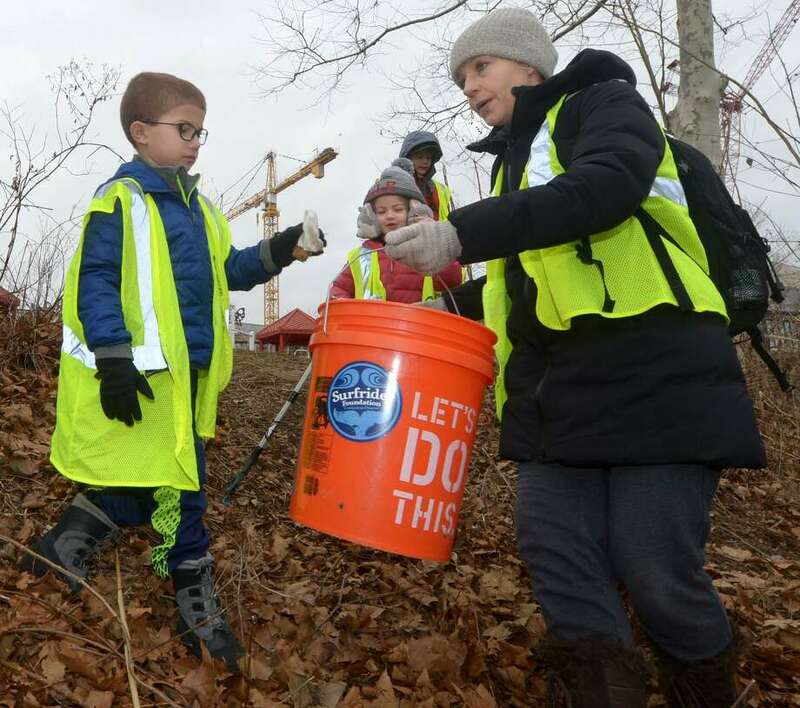 Westport resident Emma Cusato and her children, Jimmy, 8, and Anna, 5, pick up trash as Surfrider and SkipThePlasticNorwalk.org organize a clean-up of Oyster Shell Park in support of Norwalk's plastic bag ban on Jan. 19 in Norwalk. Challah expert Rochie Pinson, acclaimed author of “Rising: The Book of Challah” will exhibit the hands-on techniques on how to braid challah dough into loaves. At the conclusion of the evening, participants will return home with two loaves of braided challah dough with their favorite toppings. The acclaimed National Comedy Theatre will be on hand to entertain with comedy. Wine and desserts will be served, and Pinson will also do a book signing. The event will take place Jan. 31 at 7 p.m. at Beth Israel of Westport/Norwalk Chabad at 40 King St. in Norwalk. Admission is $44 per person. VIP sponsorship is available at $180 which includes two tickets plus a cookie sampler from the new Crumb Together Bakery. The program is for anyone who has an interest in learning the art of baking and braiding challah. All proceeds will benefit the nonprofit Circle of Friends program that provides year-round a schedule of social events, home visits and play dates for children, teens and young adults with special needs. For information, email cof@circleoffriendsct.org or call 203-293-8837. Pokeworks, one of the nation’s largest and fastest-growing poke brands, has signed multi-unit agreements to open eight new locations in Connecticut, according to a news release. The brand is setting out to transform Connecticut’s fast-casual segment with plans to bring fresh, affordable and superior seafood to Westport and Hartford with five and three locations, respectively. The first Westport location is slated to open at 396 Post Road E. Unit 30 in February, and the first Hartford location is slated to open at 1383 New Britain Avenue in April. As the pioneers who introduced the world to the poke burrito, Pokeworks has carved out a niche in the food industry by serving up Hawaiian-inspired poke bowls, burritos and salads. Founded in 2015, with its first location in Midtown Manhattan, Pokeworks was created by brothers, Michael Wu and Peter Yang, and college buddies Kevin Hsu and Kasper Hsu. After many trips to Hawaii filled with lots of poke, they began to incorporate different combinations of mix-ins and toppings. The exhibit opened Jan. 23 and runs until July 30 at the Mollie Donovan Gallery in the library. Cost is $5 for adults, $3 for students and seniors, and free for members and children under 10. Gallery hours are Tuesday through Friday, 11 a.m. to 6 p.m., and Saturday from 10 a.m. to 5 p.m.
A five-week LiveGirl program will take place on Thursdays from 3:45 to 5 p.m. at Westport’s Toquet Hall Teen Center beginning Jan. 31 through March 7, Westport Youth Services Program Director Kevin Godburn announced in a news release. LiveGirl is a nonprofit organization whose mission is to empower girls through year-round leadership development that builds self-confidence and fosters diversity. The goal of the upcoming LifeGirl talk will be to build social-emotional intelligence and self-esteem. This is a free program and space is limited. Register at www.golivegirl.com/leadership. For information, contact Godburn at kgodburn@westportct.gov or 203-341-1155. Save the Children’s Fairfield County Leadership Council will host “A Night at Studio 54” on Feb. 9 at Suzuki Music Hall in Westport. This Valentine’s Day-inspired event will feature signature cocktails, food and dancing with disco music performed by Band Together CT. The evening will benefit Fairfield-based global humanitarian organization Save the Children, which is marking its centennial in 2019. The event will take place from 7:30 to 10 p.m., and tickets are $125. To learn more about the event and to purchase tickets go to savethechildren.org/studio54 or email IPGEvents@savechildren.org.